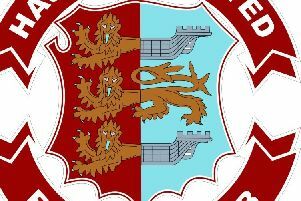 Hastings United manager Chris Agutter says the football club isn’t performing anywhere near the level it can, despite going second in the table this week. Hastings made it seven Bostik League South East Division wins out of eight with a 4-0 victory at home to Greenwich Borough on Tuesday night. Agutter said: “It’s going alright. This was another game really to look to build a bit of momentum after two disappointing cup exits. “I’m really pleased with our league form. I think we’ve got a 100 percent record here in the league and it’s good to maintain that. “We’re still not anywhere near what we can be - and that’s not me chucking that one out there. We’ve genuinely got so much to improve on. “We’re still playing in spells rather than dominating for 90 minutes like we did against Horsham (a 2-0 win on September 25) - that’s probably our best performance. Hastings are now seven points behind unbeaten leaders Cray Wanderers with two games in hand having just embarked on a run of 10 matches in 33 days across all competitions. “We feel like we can build that momentum and get back in touch with Cray,” continued Agutter. “I don’t think it will define our season, but I think it’s a really good opportunity over the next month to get back on track in terms of games played and points accrued. “We just need to keep looking after ourselves really. Cray have set the benchmark this season and they’re a very good side, but we need to keep our house in order and keep plugging away. Hastings gave a debut to right winger Lanre Azeez against Greenwich having recently brought in Youssuf Bamba on the opposite flank. “I’m really happy (with the squad), but from a personal point of view, I always try to improve, I always want to get better at what I’m doing, and the staff and players are the same,” added Agutter. “All the time you’ve got that mentality you’ll never be 100 percent comfortable with where you’re at - and I think that’s good. “Lanre’s come in and played really well - he puts the ball in the box with quality, gets at the full-back, he’s mature as well, makes good decisions. “Up until now Dayshonne (Golding, who plays in the same position) has only had a little bit of competition and you could when Dayshonne came on as a sub he was tearing round all over the place. Hastings will host 17th-placed Three Bridges in the league today (Saturday, kick-off 3pm) before travelling to Southern Combination League Premier Division high-flyers Saltdean United for a Sussex Senior Challenge Cup second round tie on Tuesday. Bostik League South East Division top half (played-points): 1 Cray Wanderers 10-28 (+19 goal difference), 2 HASTINGS UNITED 8-21 (+14), 3 Phoenix Sports 11-20 (+5), 4 Hythe Town 10-19 (+6), 5 VCD Athletic 10-18 (-1), 6 Whyteleafe 8-15 (+6), 7 Haywards Heath Town 10-15 (+3), 8 Whitstable Town 10-15 (-1), 9 Ramsgate 10-14 (+2), 10 Sittingbourne 10-14 (-1).